This residence was designed in 1927 by the renowned architect Paul Revere Williams for Bruce Blackburn and his wife, Lula E. Blackburn, in the Spanish Colonial Revival style. Bruce Blackburn was the inventor and manufacturer of the roller screen that could be rolled up and stored inside a canister above the window. These screens are found throughout Blackburn’s home and Williams would continue to use the product in other homes he designed. The house displays many of the signature design elements that Paul R. Williams used during this period, such as a two-story entry, arched doorways, vaulted ceilings, interior tile-work and wood paneling. Bruce Blackburn lived in the house until his death in 1962. Their daughter Elizabeth lived there until 1978. Paul Revere Williams was one of the premier architects of mid-20th century Los Angeles. His homes were each unique and well suited for their sites. Williams, who was the first African American architect to be elected as a fellow of the American Institute of Architects, was responsible for the designs of the homes of much of the area’s rich and famous, yet he also did work for many lesser heeled clients, as well. 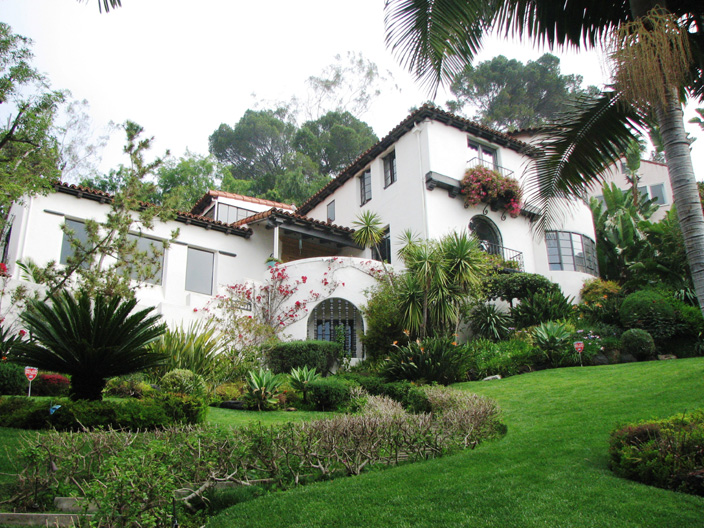 The Blackburn Residence is significant to his early career as an example of his residential work on hillsides as well as an important example of Spanish Colonial Revival architecture. The style began its use in Southern California around the time of World War I as an advancement on the earlier Mission Revival Style. Both styles have their roots in the early Spanish-Mexican history of the Southwest and became popular as many new residents, as well as more established ones, sought a California lifestyle that reflected the area’s romantic past. The original owners were Bruce and Lula Blackburn. Bruce Blackburn was born in Hunnewell, MO on January 31, 1875. He married Lula E. Janes in August 1897 and their daughter, Elizabeth was born May 25, 1898. The family relocated to New Hampshire Avenue in the West Adams District during the first decade of the 20th Century. Over the next few years, Bruce Blackburn invented and began manufacturing the rollup window screen. Lula E. Blackburn and their daughter, Elizabeth were both active socially especially in the Ebell Club and the Matinee Musical Club, with both serving in various offices for the organizations. Elizabeth Blackburn never married and lived with her parents until the end, remaining in the house until 1978. Over the years, the Blackburn Residence was an important social gathering place, appearing periodically in the Society Pages.